So this is what just happened to me today. Upon firing my Dremel, without any advice, it blew out dust like crazy in a crunching noise, with the usual smell of opal being ground. Suffice to say I immediately shut it off. Best guess: a small chunk from the last time I used it probably got sucked into the tool and was released when I fired it today, causing severe damage. Once unplugged, the first thing I noticed when extracting the carbons was that they were pretty damaged. Upon closer inspection, one of the brushes of the rotor had been torn out, and three of the others were partly warped, shorting several coils. I sure could fix it by replacing the dead brush with epoxy, the motor would have run, albeit with a coil always off so with an unstable rotation. Because these collector tabs are hot-glued to the rotor with a metal tab protruding into the glue, they are really strong and can’t be pulled out by centrifugal forces. Glueing one back, with its attaching tab broken, could work but only for very low speeds, and the risk of it being ejected again and causng more damage to the tool is simply too high. 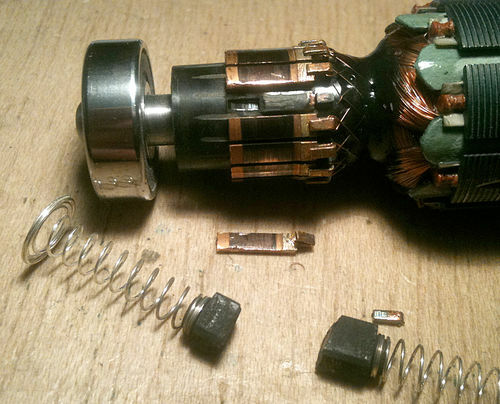 My stator didn’t suffer any injury, as the other parts of the Dremel. I don’t want to buy a new one, because of the price: this unit is ten years old, and without that pesky piece of green Madagascar opal being sucked into it (that’s the last thing I used it to grind) it would have continued serving me well. And suddenly it struck me: the guys at Dremel make fantastic, rugged products, that can last for a lifetime. I thought they might have a parts service. So I went to their website, and BINGO, in a matter of seconds (scrolling down to the bottom of the page) I found the link to the replacement parts service. 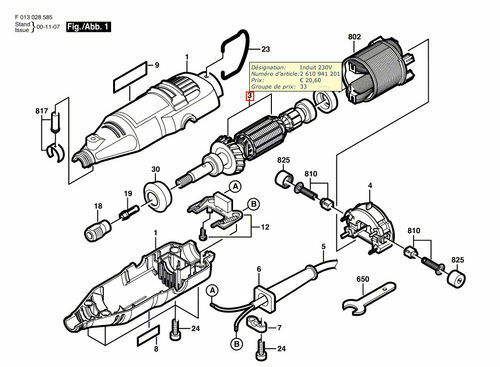 an exploded view of the tool (not sure if that’s the proper naming, we say “vue éclatée” in French) lets you select the exact part(s) needed, and they can be purchased online individually. It is good practice, when changing the rotor of a brushed motor, to also change the brushes – so I shelled out for both. 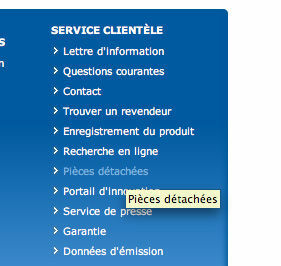 Postage and handling via TNT are a bit less than 8€, which is fine. All in all, it cost me 38€ to get the parts, probably not the best choice price-wise, as it’s nearly the cost of a new Dremel. But I like this Dremel 285 I have, its shape is okay for me, not too little, not too big, and, well, quite manly. I find the new ones too girly personally. So, big props to Dremel for having a consistent line-up of tools, based upon the same, time-proven parts: who’d have thought that I could find the same rotor ten years after buying this tool? I wouldn’t at first. Next: wait for the rotor and carbons to be delivered (probably tomorrow, they use TNT), fix the Dremel and continue the project I was working on. Great to hear and Thanks Thomas. I have had a simular experiance with Dramel. Yes, Dremel is propably best brand. I was impressed when I learned that the CSR’s you talk to on the phone are, in fact, located in Racine, Wisconsin. I am not surprised. They have managed to dominate their niche in the tool market for good reason. Yep. Great tools and great service.